Pinksummer: The exhibition title, “Wunderkammer”, carries a tradition of accumulation and an idea of wonder connected to anything that is unusual, astounding, exorbitant. The dust of your “room of wonders”, collected at Palazzo Ducale, here in Genoa, where we are, and plastered on pinksummer’s walls and vaulted ceiling, replaces the collection of decontextualized objects with the selection of a single, subtle recontextualizing object, directly connected to the history and the identity of the place. Does the choice of reinventing the idea of wonder as something no longer resulting from the sum of elements but from their subtraction instead, end up turning the Wunderkammer’s horror vaqui into whatever could be felt by whom enters such an almost empty room? Or, on the contrary, is it about hoping that who enters is amazed by perceiving plenty of memory through that absence of matter? 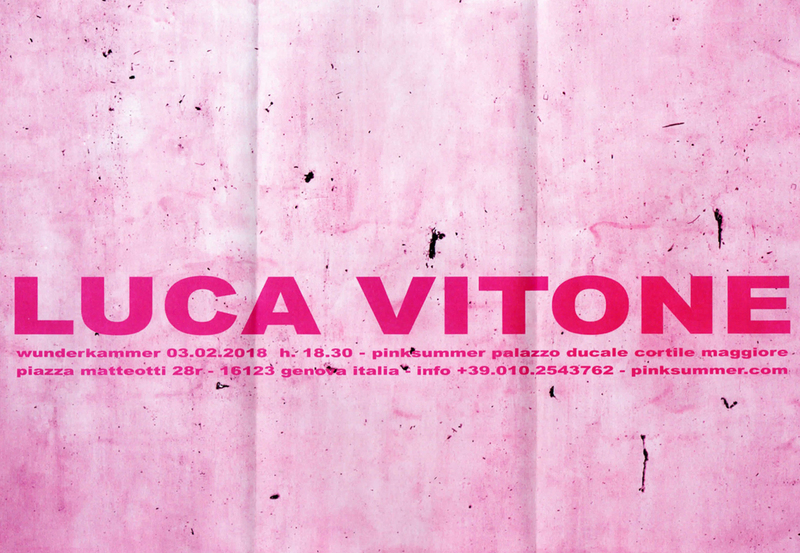 Luca Vitone: The title of the exhibition is a trick to tell about an apparent vacuum that fills up the gallery. A Wunderkammer is a room packed with objects and the gallery’s walls will be completely covered by the dust of Palazzo Ducale, central, thousand-year old place, that belches history and memory of the city of Genoa, the place where, perhaps not by change, the gallery is located. Wunderkammer is a room that expresses the obsessive will of the collector, who fills it with objects gathered in order to tell a story and his own existence, historically the one of a wealthy member of aristocracy. In this case the social position of the subject is inverted and the Wunderkammer could be the astonishing result of an enlightened cleaner. Who enters the gallery is surrounded by a layer of dust that observes him or her. What is made evident is what is usually invisible. The pigment covers all the surfaces like it does in a room frescoed by Giulio Romano. PS: In this particular case, the dust is recalling an infinitesimal dimension of the matter, being considered the threshold of visibility until the invention of the microscope. Apart from the suggestions coming from art history and your history within art, did working with dust imply any reflection on invisibility or rather on visibility and its conditions? In other words, does the dust have something to do with the definition of “nothing” or rather with the liminal one of “little”? LV: A room that seems to be empty at first, but where, same as in the darkness of a planetarium when slowly our iris opens and, by raising our gaze, we recognize the celestial vault, here little by little we realize to be surrounded by a real element that accompanies our life. Such a fact fills up the room and transforms its apparent emptiness. PS: Henri Lefebvre tells about lived spaces as spaces of the representation in contrast with the representation of space. Any lived space implies necessarily the dimension of time. You asserted that time is an instrument, the means through which things take place and become place. In the beginning, your work aimed to turn qualities into quantities, cognitive issues into ontological ones, as if you felt the need to apply to memory a bizarre kind of Euclidean topophilia. Is it possible that lately you are getting less ontological in respect of what you previously defined a realist, Courbetian and socialist stance, and let yourself go to a more inductive, universalistic and somehow counterintuitive attitude? We are thinking at your series called “Polveri” and “Agenti Atmosferici” series, but most of all at the invention of the large olfactive sculptures presented in Venice and Berlin. L.V: Here the real gets staged, what there is and what it is. Dust is a persistent element that occupies the space. Every time we try to eliminate it, a little later, it deposits in the same places from where it has been removed and it accumulates slowly. This way, dust becomes a metaphor of time and existence, its consistency testifies the essence of a place and of who inhabits it. It’s a portrait, a realistic portrait with no mediation. The shift from dust to pigment implies no alteration and the resulting image represents therefore a real moment from a time lapse, that tells about a place and who acts in it. PS: Acting by subsequent layering like a palimpsest, dust amounts to a union of past and present open to become the receptacle of future. Therefore, to us, dust seems to suggest a lasting and nearly holographic idea of time, instead of a punctual one, an idea that necessary demands someone crossing that time and perceiving through it. If we think that Husserl asserted that perception is the action that sets under our observation something in itself, we can say that your work is partially moving away from a realistic reading of the world, towards a more phenomenological methodology. The “Polveri”, as the “Agenti Atmosferici” tend to stop the erosion of time, by recognizing it and by sussuming it. Does a portrait deeply concerned with the idea of time recall the still life composition, the Vanitas? LV: Right, I would rather think myself as a window than as a door, a window that observes the landscape, the world surrounding us, and that, if opened, lets there be a draft. PS: Speaking about thresholds, you have always juxtaposed inside and outside, home environment and landscape. Since “Identificazione del luogo” you built up some couples of opposite and complementary concepts such as the “Agenti atmosferici” and “Polveri” series. Back to the inside/outside category what could be complementary and opposite to the Chambres? LV: I do not know if there will be something complementary/opposite to the Chambres. In the case of monochrome paintings I was interested in telling about both private and public world through that anti-pigment which is the dust. I decided to use paper for the interior because the dust I collected and used as a pigment was washed like watercolour and paper is the preferred support for that medium. Also, paper is more fragile than canvas which helps me in portraying a private situation, no matter if that is the portrait of a place or a person. I use canvas for the outside environments instead and I leave it outdoors waiting for time and weather to imprint the mark of their passage (and presence ) on it: while perceiving itself, landscape paints its self-portrait. For that practice, canvas is more resistant and I assimilate weathering, fatter than dust as an anti-pigment, to oil painting, a perfect medium to portray a public context.